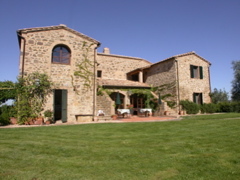 The stone farmhouse of Il Poderuccio, an agriturismo near Montalcino in Tuscany. Even if you can't afford your own farmhouse in Italy—or Provence, or Ireland, or Andalusia, or wherever your dream countryside resides—staying on a working farm, or agriturism, gets you up close with the rural heart of a destination. You don’t even have to milk the buffalo for mozzarella or stomp the grapes for wine (though sometimes being a temporary farm hand for fun is an option). 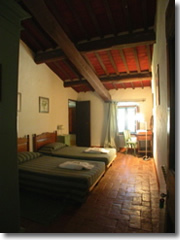 A country-comfy room at La Rignana, an agriturismo in Tuscany's Chianti region. In some countries, the practice of agritourism is highly regulated; in others, it’s a wild west of opportunities, and you have to pick carefully to avoid spending the night in a barn atop a pile of hay (unless that's what you want—I've done it, and it's great). Every local tourist office in agriturism-packed countries like Italy, France, and Ireland has lists of local farm stays. Sadly, few are listed in English-language guidebooks—but there are often agriturismo guides available in local bookshops—in Italian, French, or whatever the local lingo is, of course, but the important bits are easy enough: addresses, prices, and phone numbers, photographs, and icons for private baths, swimming pools, etc. You can always just look for agriturismo signs on country roads, pointing down rutted dirt tracks toward a farmhouse set among the vineyards. » Agriturisms in The U.K.
EuroGites (www.eurogites.org) - The European Federation for Farm and Village Tourism is a links page to the biggest and, more shall we say, "official" farm stay organizations in 27 European countries (most have Web site links, a few just contact info and email). ECEAT (www.eceat.nl) - The European Center for Eco Agro Tourism is a Dutch concern selling guidebooks to agritourism establishments across Europe. Its sister site www.groenevakantiegids.nl (all in Dutch, but the details are easy enough to savvy) lists more than 1,000 agriturisms in 24 European countries. Rural Tourism International Training Network (www.ruraltourisminternational.org) - Aimed at helping European farmers set up agriturism operations, but since it lists local resources in each country, also useful for we potential guests as well. Organic Places to Stay (www.organicholidays.co.uk) - OK, nearly two-thirds of the listings here are lodgings that happen to offer organic food. The other third, however, are B&Bs, rental cottages, or homestays on working organic farms. The bonus is that there are tons of listings ranging all over the world (Europe, North America, South America, Africa, Asia, and Oceania). Farm stays: There are more than 100, listed by country to the left.